Geocaching is a global high-tech treasure-hunt. Participants use a combination of online clues and GPS coordinates to find "caches" hidden in unique and interesting places that they might not have discovered on their own. This is a wonderful way for families to learn and explore a new area together! Currently, there are over 1 million participants and over 1 million caches hidden in over 100 countries. Participants who complete the trail will receive a commemorative coin featuring the Gems of Rockbridge Geocaching Trail on one side and the 75th Anniversary of the Blue Ridge Parkway on the other side. Commemorative coins are available as of 5/29/2012. How do I get started on the Gems of Rockbridge Geocaching Trail? Download a copy of the Gems of Rockbridge Geoaching Trail PASSPORT or pick up a copy at either the Lexington Visitor Center or Buena Vista Visitor Center. Complete the passport by finding each of the 10 GEOCACHES associated with the Gems of Rockbridge. Bring the completed passport back to either the Lexington Visitor Center or Buena Vista Visitor Center to redeem it for your commemorative coin. The completed passport can also be mailed to: Rockbridge Area Tourism, 106 E. Washington Street, Lexington, VA 24450. Two travel bug hotels have also been added to complement the trail. Pick up a travel bug (or trackable coin) at either hotel, and help them reach their destination by moving them to another cache. Trackable coins are also available for sale at both the Lexington Visitor Center and Buena Vista Visitor Centers for $10. Please email info@lexingtonvirginia.com with any questions. Explore two states and five counties while completing this challenge along the scenic Rt. 39. Find caches and win a special commemorative coin (available at the Visitor Centers along the way). How do I get started on the Appalachian Byway Geocache Challenge? 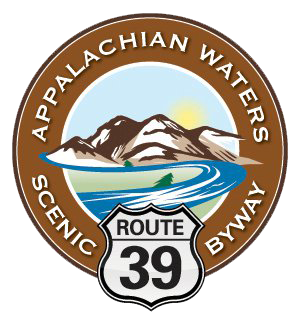 Visit Scenic39.com to learn how to get started on the Appalachian Byway Geocache Challenge and learn about attractions and events along the Rt. 39 Byway as you travel through the beautiful states of Virginia and West Virginia.